For a few decades, differing opinions have existed over whether medical carts do improve the ergonomics of the medical field and its workforce. The purpose of their initial introduction into the medical arena was to enable hospital staff to take the nurse’s workstation to the patient. However, these carts presented challenges of a new nature, unforeseen by the original designers. Despite the huge leaps in design that are evident in the history of medical carts, there are still those naysayers who argue that ergonomics remains a challenge. Their concerns involve physical aspects, such as the weights and heights of the units, each with its own unique dimension. They also involve philanthropic concerns, such as whether having digital charts at your fingertips does result in more time for direct patient care. The oversized, overweight, unwieldy forerunners of today’s medical carts have evolved into a variety of smaller carts, more specialized in their functions. They are also fashioned from much lighter and more durable materials, while sporting stronger, more smoothly running wheels. Despite these improvements, perfection is still a long way off. The confined space of most hospital environments is partly responsible for keeping the ideal cart at bay. Manufacturers are continually seeking ways to improve designs to make sure users have carts that are easy to move while loaded with the newest gadgets. This increases the pressure on medical cart designers to come up with a happy medium that can maintain such a fine balance. And speaking of balance, although the cart itself must not become top heavy, the base needs to be kept narrow enough for maneuvering between beds and along narrow corridors. The general assumption is that being able to enter vital statistics and other essential data immediately into the medical cart’s on-board system saves hospital staff precious time. Some would dispute this, saying that in making administration easier, we have also increased the number of tasks that can be assigned to an individual staff member. They argue that medical staff actually spend more time being present with their medical cart computer than with their patients. There may be truth to this argument. However, some studies have shown no significant change in the allocation of time when hospital staff switch from one system to the next. There does seem to be something else at play, as suggested by further research highlighting quality of time spent as opposed to quantity. Possibly, the perceived value of ergonomics can be attributed to the mental outlook of the staff themselves, and to their commitment to monitoring their own movements. Designers of medical carts have responded to the concerns of the ergonomically-minded by introducing carts boasting adjustable heights that use hydraulic systems. The ability to adjust the monitor’s angle and the position of the keyboard and mouse have also gone a long way toward reducing the occurrence of stress injuries. Repeated actions that cause bodily discomfort, no matter how minor, can result in repetitive stress injuries — if not immediately, then possibly later in life. With the increase in public awareness around ergonomics, even basic office furniture design has evolved to allow standing, sitting, and even walking while at work. Huge strides have been made in streamlining the design of medical carts. 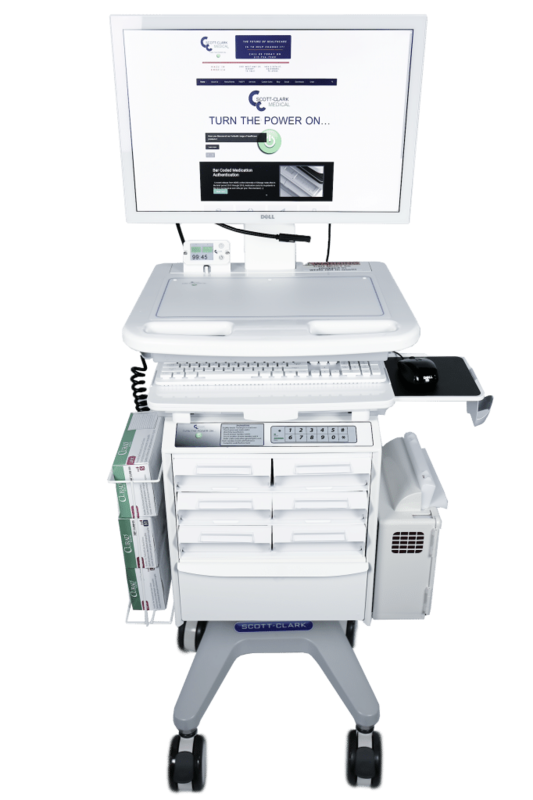 Along with these improvements, designers have significantly upgraded medical cart ergonomics when it comes to desk height and equipment flexibility. This has been no mean feat since health considerations also need to be taken into account. Sterile units are a must, especially in the case of point of care carts. This restriction diminishes the pool of possible base and surface materials. Researchers and designers continue to plumb the depths of knowledge and innovation. As a result, the end user is able to reap the benefits of having optimal equipment at their disposal. While every step we take in progress brings new challenges, we can embrace and meet them together.